Before the civil war erupted in his country, Wasim Soufi studied English literature in Aleppo, Syria. His road to Canada was a long one. He fled Syria and worked for a few years in Saudia Arabia, but when his contract ended, Wasim knew returning to war torn Syria was not an option. Fortunately, Wasim had met a Canadian, Andrew Harvey, in Aleppo in 2006, and the two had become fast friends. When it became clear he was going to be deported from Saudi Arabia, Wasim reached out to Andrew for help. Andrew recruited Clare Glassco, and together they formed OC Refugee to sponsor Wasim and his wife Rasha to come to Ottawa. In November 2017, nineteen months after the application was submitted, Wasim and Rash arrived in Ottawa. While many newcomers find their first winter to be harsh, Wasim appreciates it and hopes to take up ice skating next year. “I am deeply honoured to receive the Welcoming Ottawa Ambassador award,” says Clare. She credits Wasim’s strength and tenacity for his success. “Although I gave Wasim moral support to help him in his job search, he was the one out there pounding the pavement every day.” Wasim now works for a language company, teaching Arabic to Canadian diplomats. Once Wasim made contact with Clare to begin his application process, he mentioned to her how concerned he was about his cousin and his family who were also about to be deported from Saudi Arabia. 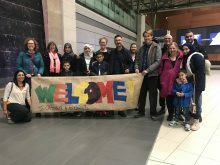 It didn’t take Clare long to jump into action to bring Abdulaziz Aboud, his wife Mayada and their four children to Ottawa as Syrian refugees. Two years before Wasim arrived with his family in March 2018, Clare Glassco, though OC Refugee, had begun the very complex application process and detailed paperwork required for him to immigrate. “We tell her it’s your house, you can drop by at any time,” explains Abdulaziz. Clare and her family recently participated in an Iftar at his house. Iftar is the evening meal with which Muslims end their daily Ramadan fast at sunset.